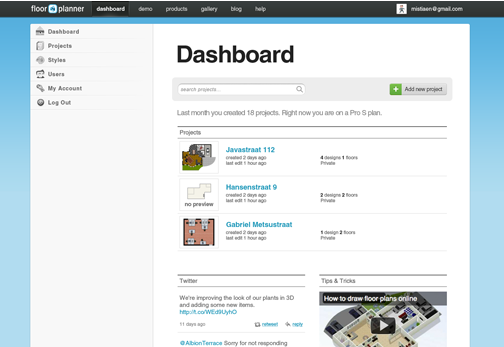 The Dashboard gives you access to everything you need within your Floorplanner account. Here you can see your most recent projects, manage your subusers and styles, get some tricks from the export and of course, start a new project. In the 2D editor you will spend most of your time. 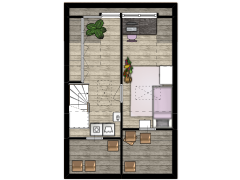 Here you will draw and decorate your floorplans. This is your drawing paper. Here you will draw your floorplan. Start by drawing your room. You can find this function on the left of the construction menu. Drag all kinds of furnishing and structural elements elements from the library containing over 1200 items. You can reach the library by clicking the sofa in the upper left corner. When you want to add a floor or design, you can do so here. 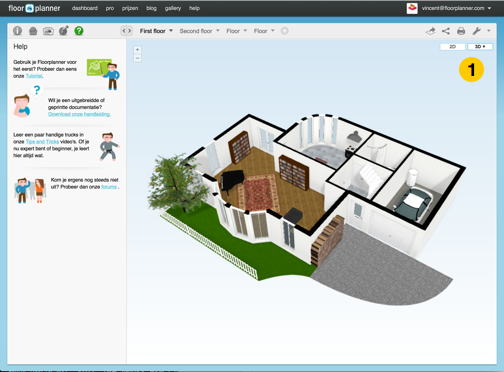 Toggle the view to experience your plan in 3D. When your done, save your plan, print it out and stick it to your wall. 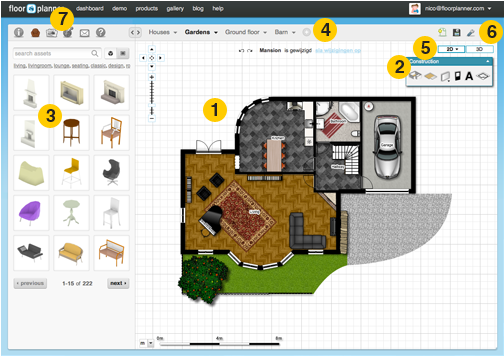 If you want to add more info about the house you've drawn, you can do that in the sidebar. You can add a description, photos, videos, 360 panoramas and the location of the property. This can be very useful, for instance when you are selling your house. When hovering the 3D-view button, a menu will appear. In this menu you can change the view settings. These settings can be really helpful when working on the plan. For example, you can hide the walls temporarily, turn off perspective distortion and go full screen.